Always wash pads before use! Fabric is pre washed and pre shrunk. Treat stains with commercial stain treatment, such as Shout or Zote bar. Machine or hand wash cold. Line or machine dry on low. → Liner: two layers of flannel. Great as a back up for a menstrual cup or tampon, or for everyday protection. 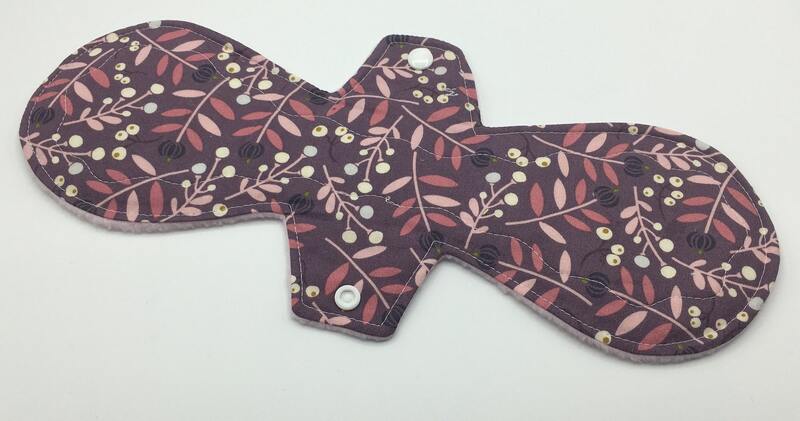 These pads are ideal if you have a very light flow, or to use at the beginning/end of your period. → Moderate: one layer of Zorb. Great for regular flow days or for incontinence. → Heavy: one layer of Zorb + two layers of flannel. 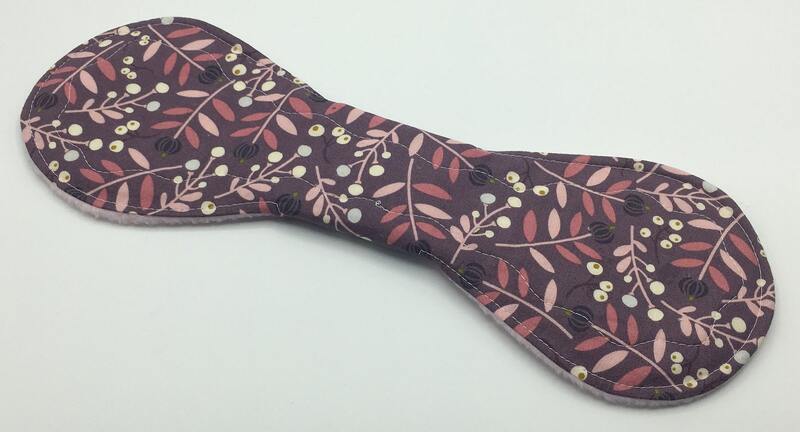 Great for heavier flows, overnight or as post partum pads. Longer lengths offer additional coverage in the front and back. → Body Friendly: Cloth pads are comfortable and more breathable than disposables. They do not carry the same risk of drying you out or causing TSS like tampons. They are also free of harmful chemicals and fragrances that can cause irritation. → Earth Friendly: The average American woman will use 16,000 disposable menstrual products in her lifetime. This produces tons of waste, from the product itself to the wrappers, applicators, and packaging they come in – much of which is plastic that will take 500+ years to degrade. Replacing these products with washable, reusable products you are making an ecofriendly choice. → Budget Friendly: The longevity of cloth pads adds up! Your initial investment in your cloth pads will eliminate the monthly cost of running to the store to purchase disposables. → How do cloth pads work? 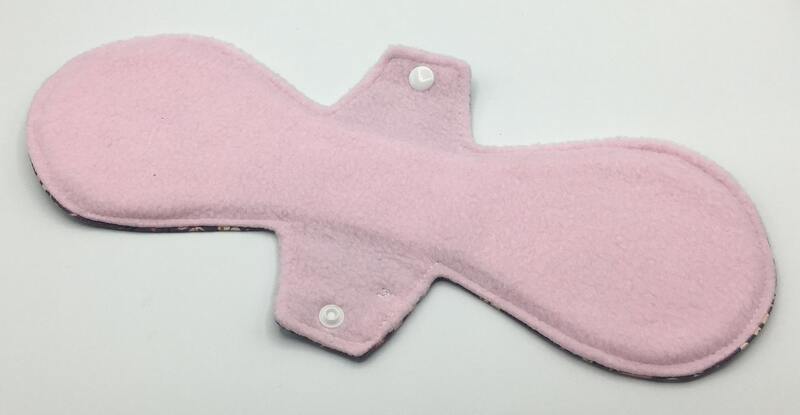 Cloth pads work by absorbing fluid in an absorbent core. → How many pads do I need? Because each person’s cycle is different, the number of pads you need will vary. If you’re making the switch from disposables to reusables, we recommend building your stash to be comparable to the amount of pads you are currently using. For example, if you use 3 disposables a day, replace those with 3 reusables. You can get enough to last your whole cycle, or if you are okay with washing mid-cycle, you can buy less. → How long will cloth pads last? You can expect your cloth pads to last 5+ years with proper care. Always wash pads before use! The fabric is pre-washed and pre-shrunk, but should always be "prepped" to ensure they are ready for their first use. Wash with your favorite detergent and treat stains with commercial stain treatment, such as Shout, Zote, or other stain stick. Machine or hand wash cold. Line dry or machine dry on low. Do not use fabric softener, as it could affect the absorbency of the materials. → Liner: one layer of flannel. Offers our thinnest and lightest option for daily wear and everyday protection. → Light: two layers of flannel. Great as a back up for a menstrual cup or tampon. These pads are ideal if you have a very light flow, or to use at the beginning/end of your period. → Moderate: one layer of Zorb. Great for regular flow days or for incontinence. Zorb is a highly popular core option for its unique ability to absorb 10x it's weight in moisture and disperses it throughout its blend of bamboo viscose, cotton, and polyester fibers. → Heavy: one layer of Zorb + two layers of flannel. Great for heavier flows or overnight. Longer lengths offer additional coverage in the front and back. → Postpartum: one layer of Zorb + one layer of SHOBF. The most absorbent of our pads, these are an excellent option for the heaviest of flows, for extra overnight protection, or for postpartum use. The super heavy organic bamboo fleece, or SHOBF, offers quick absorption while the Zorb provides a backup layer of protection against leaks. Our pads are a standard 2.5" snapped width, with postpartum options offering additional center coverage at a 3" snapped width. → How many pads do I need? Because each person’s cycle is different, the number of pads you need will vary. If you’re making the switch from disposables to reusables, we recommend building your stash to be comparable to the number of pads you are currently using. For example, if you use 3 disposables a day, replace those with 3 reusables. 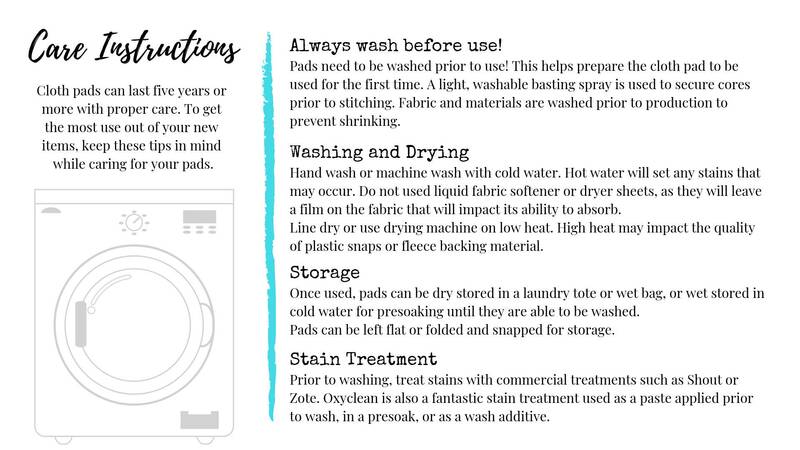 You can get enough to last your whole cycle, or if you are okay with washing mid-cycle, you can buy less. → How do I wear cloth pads? Cloth pads are meant to be worn snapped around the center gusset of your underwear. The printed cotton fabric is worn against your body, while the moisture resistant fleece goes down against the fabric of your underwear to provide a barrier. 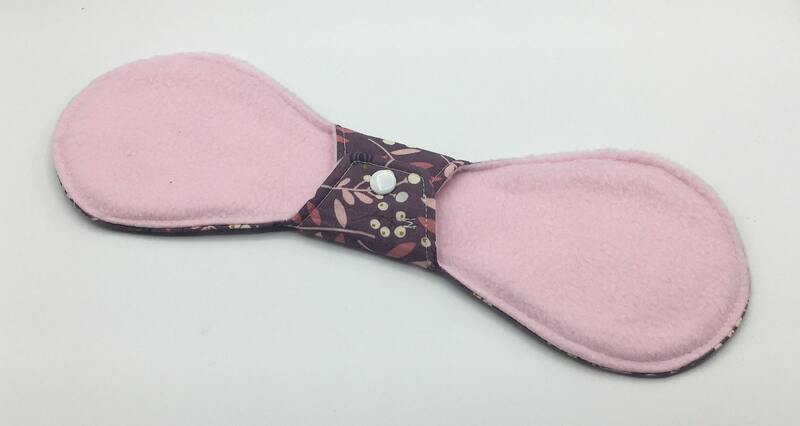 The fleece also has "gripping" properties that help your pad stay in place. → Earth Friendly: The average American woman will use 16,000 disposable menstrual products in her lifetime. This produces tons of waste, from the product itself to the wrappers, applicators, and packaging they come in – much of which is plastic that will take 500+ years to degrade. 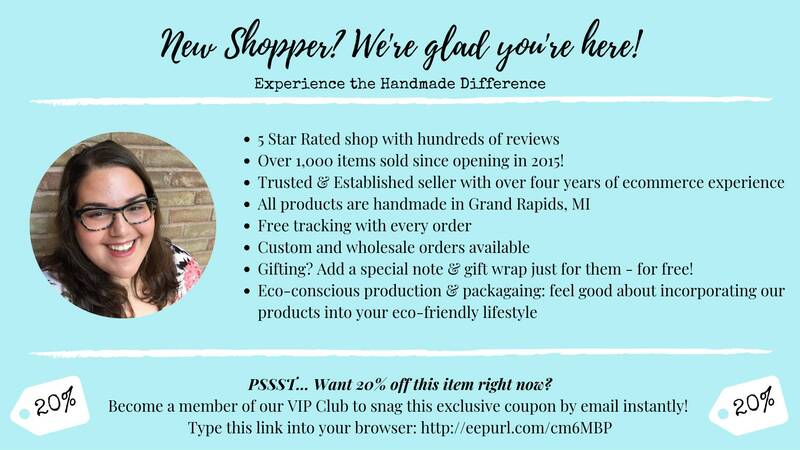 Replacing these products with washable, reusable products you are making an eco-friendly choice. -	Service providers. I engage certain trusted third parties to perform functions and provide services to my shop, such as delivery companies. I will share your personal information with these third parties, but only to the extent necessary to perform these services. -	Business transfers. If I sell or merge my business, I may disclose your information as part of that transaction, only to the extent permitted by law. -	Compliance with laws. I may collect, use, retain, and share your information if I have a good faith belief that it is reasonably necessary to: (a) respond to legal process or to government requests; (b) enforce my agreements, terms and policies; (c) prevent, investigate, and address fraud and other illegal activity, security, or technical issues; or (d) protect the rights, property, and safety of my customers, or others. -	Access. You may have the right to access and receive a copy of the personal information I hold about you by contacting me using the contact information below. -	Change, restrict, delete. You may also have rights to change, restrict my use of, or delete your personal information. Absent exceptional circumstances (like where I am required to store data for legal reasons) I will generally delete your personal information upon request. -	Object. You can object to (i) my processing of some of your information based on my legitimate interests and (ii) receiving marketing messages from me after providing your express consent to receive them. In such cases, I will delete your personal information unless I have compelling and legitimate grounds to continue using that information or if it is needed for legal reasons. -	Complain. If you reside in the EU and wish to raise a concern about my use of your information (and without prejudice to any other rights you may have), you have the right to do so with your local data protection authority. 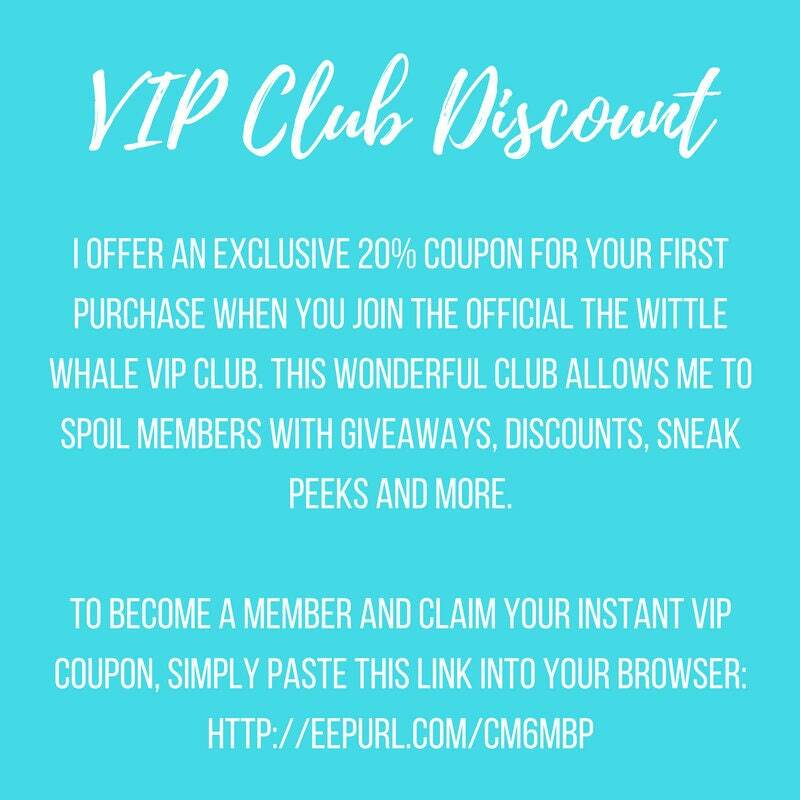 Please send me a message to discuss placing a custom order. Custom orders are created for you soon after your order is placed. Any changes to your original order submitted after 24 hours of placing the order may incur a commissioning fee. Wholesale orders are available. Please send me a message to discuss what you're looking for. Gift wrapping and packaging are available upon request.